Twin Apple grows as a small to medium-sized tree up to 25 m tall, with a trunk diameter of up to 50 cm. Its flowers are small, creamy to white, 5-petaled, 1.3 cm wide, fragrant. Flowers are borne in 2-17 cm long congested cymes, at branch-ends and in leaf-axils, in whorls of 2-4. There are more than 30 in each inflorescence. Sepals are ovate, tip rounded, thick except along the margin. Stamens are inserted at 2-2.5 mm below the mouth, 0.5-0.7 of the length of the flower tube. Leaves are in whorls of 3 or 4 (or 5), leathery or papery when dried. They are obovate in shape, light green, 4.5-36 x 1.5-18 cm. Fruits are composed of twin-fruits. Seeds is often 1 at either placenta, rarely with a small second one. 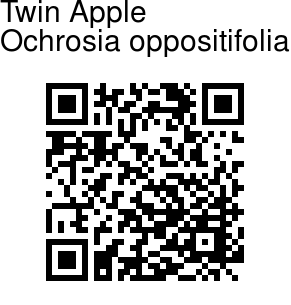 Twin Apple is native to countries from the Seychelles to Sri Lanka, Andaman and Nicobar Islands, Thailand, Vietnam, Malaysia, Indonesia, Philippines, New Guinea to the western Pacific. 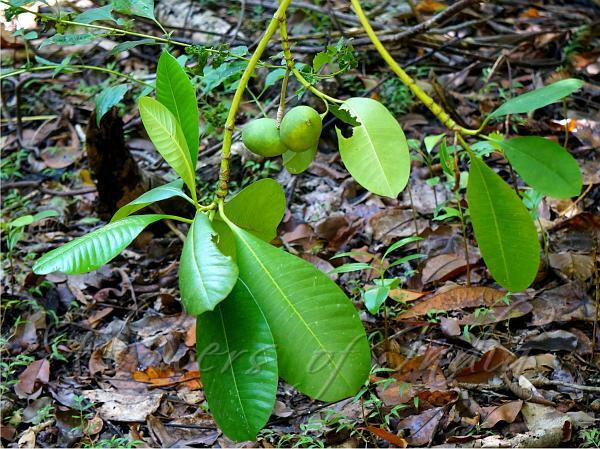 Medicinal uses: A leaf decoction is used to wash the abdomen of women after childbirth. The seeds are used in the treatment of bilious disorders, in particular as an antidote to the effect of eating poisonous fish or crabs. A decoction of bark is taken to purify the blood, as an appetizer, purgative and carminative, and in high doses as an abortifacient. The wood is febrifugal and stomachic. Cups made from the wood will give a bitter taste to drinks when allowed to stand for some time. The drinks are then taken as a stomachic. The root is used in the treatment of bilious disorders, in particular as an antidote to the effect of eating poisonous fish or crabs. Identification credit: Dhananjay Rawool Photographed in Little Andaman, Andaman & Nicobar.